Day 3 – Say Yes to the Holiday Parties that you want to go to. Say No to the rest. It’s Day 3 of my 31 Days of Healthy Ways to Enjoy the Holidays More. Hopefully you are already on your way to having a happier holiday season! 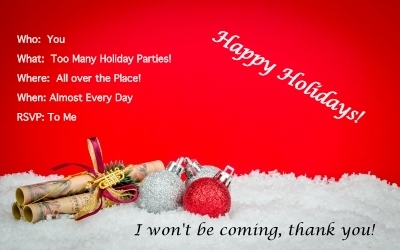 Today’s tip is say yes to the holiday parties that you really want to go to and know that it’s ok to say no to the rest. There is no rule that says if you have no plans you must say yes. Let me tell you a secret. I am someone who says “No thank you” to invitations even when I don’t have any plans. Frequently. I know that makes me sound like a jerk and I know it’s controversial to put that out there! But the amount of energy we waste doing things that don’t serve us in some way means we don’t have the energy to do the things we really want and need to do! I used to feel like I had to accept invitations if I didn’t already have plans. It doesn’t mean that I don’t like the people inviting me to something if I say no and it doesn’t mean that I don’t want to be invited to their events in the future, it’s just that I can only handle a couple of parties during the holiday season before you’ll find me outside in the snow tangled in a string of popcorn & cranberries and swimming in vat of eggnog. Not really, but after years of feeling stretched during December, I figured out my limits and it’s okay for you to also! Maybe you can handle a party every Friday, Saturday and Sunday of the holiday season. Good for you! But if you can’t, there’s no shame in acknowledging it. Accept who you are. Let go of the guilt that too many incoming invitations bring. Just because someone invited you to a holiday party does not mean you are obligated to go, even if that invitation comes from someone you once were very good friends with, lived with or went to school with two decades ago. There are only so many weekends during the holiday season and you can’t attend every soiree. The more often you say no, the more comfortable it will feel. And after awhile, it actually feels good! Then you know when you say yes to something, you really want to be a part of it. Your time is valuable and you have the right to spend it as you choose. You will have more fun at the parties you choose to go to if you aren’t overcommitting yourself. If you’re still feeling guilty or finding it hard to say “no thank you” when you need to, make sure the person whose invitation you are declining knows you value them by reaching out and setting up some time together after the holidays. You’ll make their day and you’ll feel a lot better about not being able to make it to their party. Now you’ll have some time to squeeze in that self care we talked about on Day 1. This entry was posted in Healthy Tips and tagged 31 Days, Healthy Holiday Tips on December 3, 2013 by Andrea Quigley Maynard.